You can’t compete with Fenway. But if some new place wants to throw a few pork belly burgers and a jumbotron out there to give it a shot... we suspect you’d allow it. Cue the anthem for Tony C’s Sports Bar & Grill, a gargantuan shrine to a Sox legend that’s expected to open in that glorious blur between Christmas and New Year’s at Assembly Row. It’s an homage to one of the greats. Tony Conigliaro, 1945 to 1990. Native son. Signed to the Sox at age 17. Injured in the ’67 “Impossible Dream” season. Had a 200-seat section of Fenway named in his honor. And now, this. The word “big” won’t do it justice. 11,000 square feet, 90 TVs and room for almost 500 people can have that effect on adjectives. The number 25 carries some significance here. It was Tony’s number. 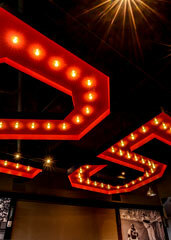 Hence the giant red “25” filled with marquee-style lights. And hence that #25 Burger with smoked BBQ sauce, crispy pork belly and a fried egg. This engineering feat required 50 55-inch flat-screens to be assembled together. Then they put a wraparound bar with 40 draft lines underneath it. You had a feeling they might.